Where do I find information about Dallas Executive Airport’s Master Plan? The Master Plan section of the website features the 2001 and 2012 Master Plan documents. You can also visit dallasexec.airportstudy.com, an external website created in 2012 to feature the most recent Master Plan documentation. 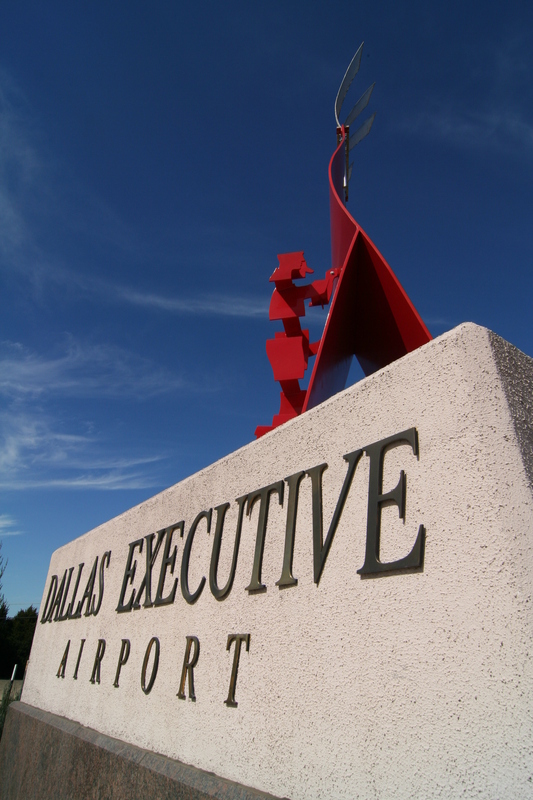 Where is Dallas Executive Airport and how do I get there? Dallas Executive Airport is located at 5303 Challenger Dr. Dallas, Texas 75237. From U.S. 67 exit onto Hampton Road, go north, turn left onto Challenger and proceed to the Terminal Building. For additional information or to get directions to a specific business on the airport call an airport staff member at (214) 670-7612 from 8:00 a.m. to 5:00 p.m. CST. Where can I meet an aircraft that is coming into Dallas Executive? Why is the construction happening? An airfield pavement analysis was conducted in 2012 to determine the load bearing weight and structural integrity of the airport’s runways and taxiways. The results determined that Runway 13/31 pavement is failing and requires full-length reconstruction which involves removing and replacing existing pavement with new pavement section. The life expectancy of the current pavement is 0-5 years with deficient pavement strength. Is the City using my tax dollars to pay for the improvements? Tax dollars are not used for projects at Dallas Executive. The Aviation Department is part of the enterprise fund, not the City’s general fund. This means all money spent by the Aviation Department is generated through Airport Revenue, FAA Funding, and TxDOT Funding. The Runway Reconstruction Project is being funded through a TxDOT 90/10 grant. In other words, TXDOT pays for 90% of the project and the City of Dallas pays the remaining 10%. The City’s 10% portion comes from revenue generated through the Dallas Airport System. Why is Dallas Executive extending the runway? The extension is to correct another deficiency in the Runway Safety Area (RSA) and the Runway Protection Zone (RPZ). The extension is needed to provide enough space on the Runway 31 (near US Highway 67) to obtain the 1,000 foot safety area required by the FAA. The extension is simply adding the pavement that was lost to correct the safety area deficiency on the Runway 31 end for aircraft taking off in the 13 direction. Even though the runway is being extended, the runway threshold, or landing point on the runway, will be shifted away from the neighborhoods along Ledbetter and Westmoreland to protect these structures from landing aircraft. How long will it take to reconstruct the runway? The reconstruction is scheduled to begin Summer 2014 and be completed Winter 2016, pending inclement weather changes. What type of impact will this have on the surrounding communities? Construction will have little to no impact on the surrounding communities. Batch plants will be staged on airport property, all dirt and other materials will be contained on site. There may be some increased vehicle traffic between Hwy 67 and Hampton. This project is expected to create jobs and have a positive economic impact in the community. What determines which runways aircraft will use to take off and land?? There are many contributing factors that determine which runway will be used. The type of aircraft, fuel load, wind direction, and temperature all affect which Runway will be used. An aircraft must take off and land going into the direction of the wind. Therefore, the runway being used is based almost entirely on the direction of the prevailing winds. Operational necessity, safety and the presence of other aircraft are other factors that determine which runways are being used. Why are some aircraft louder than others? Aircraft operating at DEA have a diverse range of noise levels. These noise levels primarily depend on the type of engine used by the aircraft, air density, temperature, size and age of the aircraft, and whether the aircraft is taxiing on the airfield, landing or taking off. A departing aircraft tends to be loudest due to the pilot applying full thrust to the aircraft’s engine. Newer aircraft have a lower noise threshold, as they are federally mandated to have lower emissions. Can aircraft fly low over my house? Federal Aviation Regulation 91.119 states that Aircraft in congested areas are required to be at least 1000’ above the highest obstacle within a 2000’ radius, except during take-off and landing. Law Enforcement and Medical Emergency Aircraft are the only types of aircraft that are granted waivers to operate outside of these regulations. Aircraft often perform practice landings and touch and goes, this may be why you see increased air traffic activity over your home. As an airport operator, the City of Dallas does not have jurisdiction over aircraft in flight or their altitudes. The FAA prohibits any airport operator from restricting airspace usage. I thought planes couldn't fly over my house at night, why do I hear them flying at night? The Airspace is never closed and the Airport does not close the runways except during hazardous weather. The Airport is available 24 hours a day. The control tower operates from 7a.m. - 9 p.m. 365 days a year. When the tower is not operational, the airport goes to an uncontrolled status meaning pilots arriving and departing announce their intentions over a common used frequency. What has the airport done to mitigate the noise over my house? The airport has posted signs to ask pilots to use their aircraft’s best rate of climb. We ask they gain altitude as quickly and as safely as possible when taking off and to be a good neighbor over surrounding neighborhoods. Why do aircraft sound louder at night than they do during the day? Night time noise events seem louder because the ambient noise is lower. More noise events may be noticed at night compared to daytime hours when there exists a higher ambient noise. Will noise increase as a result of the Dallas Executive Airport Runway Reconstruction and Extension? The noise impact area for Dallas Executive has decreased during the past decade and is expected to continue to decrease as a result of new and quieter technology aircraft even with the planned extension. Who do I contact regarding noise complaints? If I am flying into the Dallas Executive airport, what is the three-character IATA code and the four-character ICAO code? How can I find information on car and limo rental? When did the airport open? What hangars and GA facilities does the airport offer? How do I rent hangar space? Does the airport have security? Are there commercial flights at Dallas Executive Airport?